Five people were arrested outside Lowe's Home Improvement in Salem, New Hampshire, in connection with a credit card skimming operation. Five people were arrested Monday outside Lowe's Home Improvement in Salem, New Hampshire, in connection with a credit card skimming operation. As police arrived, they saw a man run out of the store and into the waiting van. The van attempted to leave the area but was stopped by police in the parking lot. Police said a total of five people were involved in making transactions using fraudulent credit cards with personal and financial information belonging to other people unknown to them. The cards located were fake, having the names of the suspects on the front, but information on the magnetic strip corresponding to other people. Ende Zou, 24, of Brooklyn, New York, on charges of theft by deception, falsifying evidence and resisting arrest/detention. Huang Chen, 28, of Brooklyn, New York, on a charge of theft by deception. Dong Yeng, 28, of Brooklyn, New York, on a charge of theft by deception. Junyin Jiang, 20, of Brooklyn, New York, on charges of theft by deception, falsifying physical evidence and possession of cocaine. Sheng Lin, 25, of Brooklyn, New York, on charges of theft by deception, transporting drugs in a motor vehicle and possession of marijuana. All five were arraigned in Salem District Court. 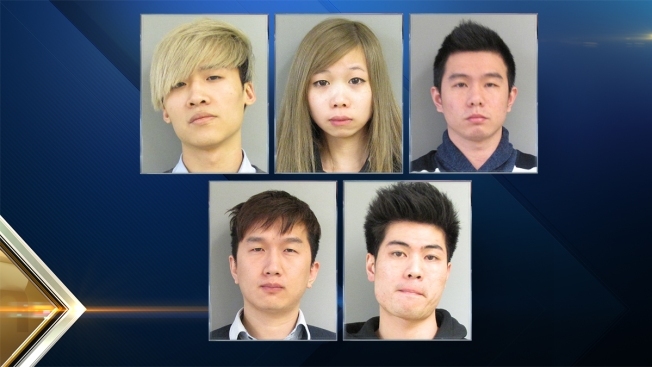 Zou, Chen and Yeng were held on $10,000 bail, Jiang was held on $5,000 bail and Lin was held on $1,500 bail. They are scheduled for probable cause hearings on Feb. 8.